Our expertise covers Quantitative Risk Management, Strategy & Digital Innovation and Regulatory Compliance. We offer services given by our in-house team of specialists. TMT Advisory provides boutique consultancy services that are above all, customer centric and personalised. 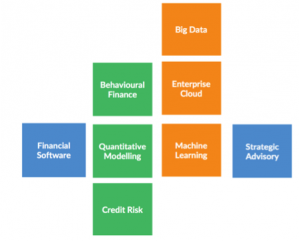 TMT Advisory has an expert team of quants, financial analysts and IT specialists for financial institutions. We advise banks and financial institutions in complex projects that involve financial analysis, financial modelling and/or IT integration. To help our clients solve today’s challenges and anticipate tomorrow’s issues. TheMarketsTrust advisory services leverages technology and financial expertise to deliver customised solutions to our clients, thus promoting efficiency and excellence. In Quantitative Risk Management, we are able to cover a broad range of topics. We support your organisation with risk management strategy development, new financial products validation, analysis and improvement of existing quantitative models for credit, market and liquidity risk. We are also focused on hand-on implementation and enhancement of appropriate risk reporting tools, calculation modules and data interfaces. TheMarketsTrust Advisory has a vast experience in the development of high complexity, state-of-the-art technological solutions. We believe that processes optimisation and high productivity can be achieved via a combination of strategy and hi-tech innovation. We help your organisation aligning IT to business goals, in consideration of the industry-wide challenges of increasing digitalisation and cost pressures. Our team supports your institution on tasks ranging from large-scale implementations of Enterprise Risk Management systems down to smaller projects of designing, developing and implementing / integrating specific software modules for new or upcoming regulations like Basel III, ICAAP, Stress testing, or IFRS9.